If a way to a man’s heart is through his stomach and women are said to be able to live on chocolate alone, its no wonder that chocolate is one of the most popular Valentine’s day gifts. Hershey’s, one of the most recognizable and beloved chocolate companies in the world has made over 1.5 billion Hershey’s® kisses® brand milk chocolates and more than 36 million heart shaped chocolate boxes sold on Valentine’s Day each year. Apart from the tasty classics, this year Hershey’s features a new Valentine’s Day collection which includes heart-shaped chocolates like the Hershey’s Bliss® Brand Smooth Creamy Milk Chocolate Hearts or York® Dark Chocolate Covered Peppermint Pattie Miniature Hearts. Hershey's even offers an option to personalize a box of chocolates with that memorable snapshot. 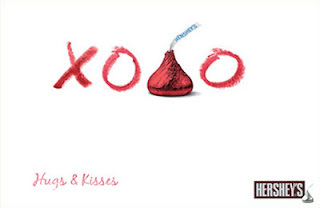 With so many varieties available there is no sweeter way to say ‘I love you”, except maybe with Hershey’s XOXO bar. Be sure to check out their great Valentine's Day recipes too for Valentine's Day or any day you feel like baking up some love! Hershey's would love to give away to one lucky reader,in the USA, a Hershey's Valentine prize pack. One winner will be selected by Random.org on February 8, 2012 from all entries received. I'd love to win the Hershey's pack!! It'd be nice for Valentine's day! You can tell Hershey's that I have so many fond memories of my life in which they have been a part. I grew up in Reading, Pa and fondly remember summer trips to Hershey Park. We always had Hershey candy in our home and to date my favorite chocolate out of everything out there today is still a plain Hershey chocolate bar! I would love some Hersheys! I'm eating a Mr. Goodbar right now! Hershey's is my favorite chocolate. We are regular buyers (weekly) of Hersheys!!!! Every year I always make the kids a little heart shaped Hershey wreaths for Valentine's Day. I'm grateful Hersheys has released more Dark chocolate treats in the past few years! I'm so glad Hersheys has released more Dark chocolate treats in the past few years! i love hershey's chocolate and all of their products! I love Hershey's!! Would love to win this!! I love chocolate and would love this. I am a Hersey addict but I am really trying to find Hersey Bliss in the Purple bag for my son's wedding in May in would be great they want to give it away to their guest. They trip for valentines with so much pain for me, coming up on my daughters 7th year since she passed her birthday is Feb 16 she would be 28, Maybe my son and his fiancee' would love it, I would just love to find the bags of candy so we can have a beautiful wedding. I LOVE Hersheys! I love their new Air Delights! I would love to win this Hershey's prize. Everyone I know loves chocolate, including me. Especially if it's Hershey's. Great taste and value. Who doesn't love Hershey's. My BF and I are addicted to chocolate of all kinds, so this would be awesome to win.